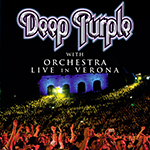 Deep Purple’s film of their 2011 show in Verona, Italy, with the spectacular backdrop of the Arena di Verona, a Roman amphitheatre. The DVD and Bluray formats run for nearly two hours and includes the standard set from the time, but on this occasion backed by a symphony orchestra. The show was shot in hi-def. NTSC Region 0. Screen Format: 16:9. DTS Surround Sound, Dolby Digital 5.1, Dolby Digital Stereo. Due October 2014 and can be pre-ordered at DTBOnline store.. The encores are listed as bonus tracks for some reason. 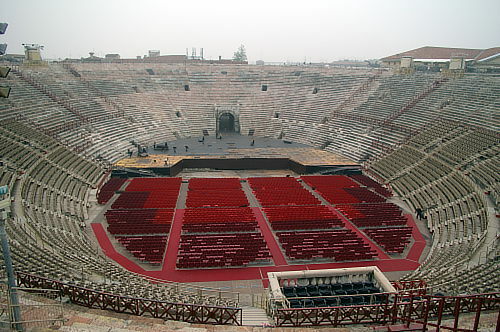 This great panoramic view gives you an idea of the venue. Apparently the local Mayor is trying to raise money to have it roofed over to reduce the number of events pulled due to bad weather. He’ll be banning the lions next. I asked to Ward Records (the official label of japan): cd version released is only for Japan. does anyone know if Eagle Rock releases the CD version or there is only one Japanese Ward Records? I’m told the CD is Japan only.